With a price tag at roughly $300 a box, buying singles from this set is a no brainer unless you don't care what auto's or relics you get or you build sets. My spidey senses told me that even if I had the money for a box of these, that I wouldn't pull a Pujols auto anyway. Clearly this was one product that made not buying boxes or packs very easy to go along with. I picked up a couple of cards on eBay and in they came yesterday. Looking at these cards online in pictures doesn't do them justice. While I hate to praise Topps, I do in fact like these alot. The game used auto cards do look silly in pictures but for some reason they aren't as bad in person, actually I think they are pretty nice. 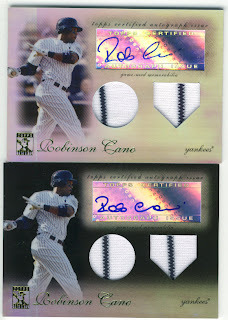 Robbie Cano has 2 auto variations in the set RC1 (fielding) and RC2 (hitting), and no base cards (snarl). RC1 and RC2 have 5 variations (sigh) of each, regular /99, blue /75, black /50, gold /25 and a red 1/1 (never gonna get). Rather than go nuts, I'm opting for RC2 and dealing with just that. I give you my sponsored by eBay bucks, 2 sold cards on eBay, and a wee bit extra, cards. I'm only trying for cards with stripes. Not bad, I say. Once I have the rainbow of colors I will present a nice scan maybe even complete with the Lucky Charms dude.